If you've been yearning for that perfect place to leave the world behind then Crabapple cottage is just what you're looking for. Unwind with a glass of local wine on the private, expansive deck with valley views. Relax knowing your pet is secure with you on the enclosed deck. Enjoy the ambience of the stunning Hotham stone fireplace with wood provided. Set the mood with the collection of smooth jazz & classical CDs. Enjoy the light & spacious lounge with vaulted ceilings and flat screen TV/DVD. Comfort is offered year round with a reverse cycle split system & electric heating (even in the bathroom!). Prepare a romantic dinner for 2 in your open plan, fully equipped kitchen with dishwasher. Start the morning perfectly with a coffee from your pod machine and a cooked breakfast with valley views. Enjoy a Webber BBQ as the sun goes down on the North facing deck. Too relaxed to cook? Dine at the quality hotels & cafes just a short stroll from your cottage. Your spacious bedroom with comfy queen bed features a ceiling fan & electric heating. All bedding & linen is provided. Relax in a hot bath after a day exploring and enjoy the hotel quality toiletries provided. This home away from home also features a washing machine & dryer for your convenience. Crabapple Cottage truly is the ideal destination to leave your city blues behind and enjoy a relaxing break with the one you love.... and fido! 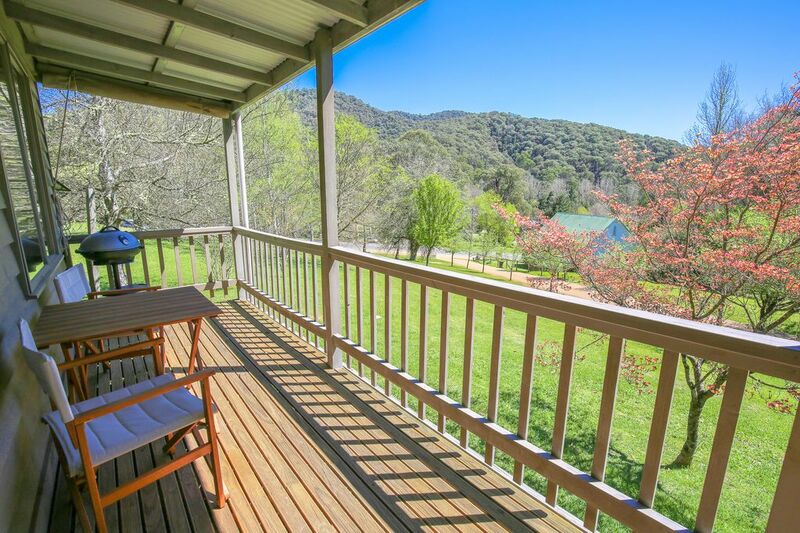 Within 5 minutes WALK from : the centre of Harrietville! Harrietville is the Great Alpine Roads hidden treasure. Situated just 25km from Bright, it is also the closest off mountain accommodation to Mt. Hotham. Harrietville is the perfect place to relax & unwind surrounded by rugged mountains, gentle rivers & some of Victoria's most breathtaking scenery. The Ovens river offers great fishing and an array of designated walking tracks will suit every skill level. The area is also renowned for cycling, 4WDing and motor bike riding - on & off road. This historic town offers plenty to see & do with the historical museum, Pioneer Park & old gold mining dredge. The 'Tronoh Lake' reserve features walking tracks, bbq facilities, and fantastic swimming & fishing with a jetty, pontoon & boat ramp. Harrietville boasts excellent dining & entertainment with a coffee house, ice creamery & 2 hotels serving quality meals highlighting local produce. Acclaimed restaurants, wineries & attractions are a short drive along the stunning Great Alpine Road as are the towns of Bright, Wandiligong & Beechworth. Harrietville is the ideal destination to enjoy an affordable & relaxed snow holiday! Save loads by staying in Harrietville, with easy access to daily bus services & private shuttles to get you up & down the mountain. Explore the region on a 'day off', get the best of both worlds! Enjoy the magnificent sun rises & sunsets and mountain views as you drive or get shuttled up the hill - the drive is so worth it for this, especially for photographers! Harrietville has quality ski hire outlets with affilliates on mountain (in case you need to swap your gear). You can arrange all you ski hire, lift tickets, lessons, gear, chains (the whole lot!) before you head up the mountain!! SAVE TIME, AVOID THE QUEUES, SAVE MONEY! Book with us to receive up to 25% off ski/board hire, ski gear & chain hire! All winter, Harrietville boasts regular entertainment, great food, a fantastic alpine atmosphere and everything in easy walking distance. If you feel like a change you also have central access to Falls Creek, Mount Buffalo or anywhere else you would like to go...... WHY NOT! Your furry friend is welcome to join you at Crabapple Cottage. Dogs are welcome inside the house while you are with them but must stay outside or go with you if you are to leave. The long undercover verandah is secure for your dog to stay while you leave. *Please check with us though in peak periods if a booking gap appears or if the dates are approaching! What a treat the Crabapple Cottage is. Upon arriving to this cute property nestled upon a hill, we spotted an apple left in one of the fruit trees on the driveway - a gesture that wasn't missed on us and we appreciated the little touches this property has to offer. Inside the property is super clean, not cluttered, comfortable and has all the extra touches you really love on a getaway. We had a go at one of the puzzles over a glass of wine, and great jazz cd's to play on the stereo, and loved lighting the real open fire. No need to worry about wood, all is available. The kitchen is fully equipped with everything you could need and we enjoyed cooking dinner at the cottage on one night. The bedroom linen was hotel quality, super luxe and relaxing. We loved that we could walk into town and grab a morning coffee or a glass of wine, so close to centre of town. A clean, modern property still with a cottage feel without the clutter = ideal. I would definitely return to this cottage for a getaway - thank you. We loved the cottage, very clean, comfy bed, our little dog loved all of the yard to play around in. Great location and the hot cinnamon donuts at Bella cafe were scrumptious. Lovely, cosy property in a beautiful little town . Very happy. Quiet location, clean and a great fire place. We stayed there before and came back to celebrate our anniversary. Thanks Ray! Hope to see you again soon! Best cottage for a quiet, romantic getaway ! This is the 2nd time we've stayed at Crabapple Cottage.The beautiful surroundings and perfect weather we had just made our stay a magical experience. Highly recommend this cottage for couples who want a romantic getaway in a quiet, intimate environment. Will definitely be coming back again!